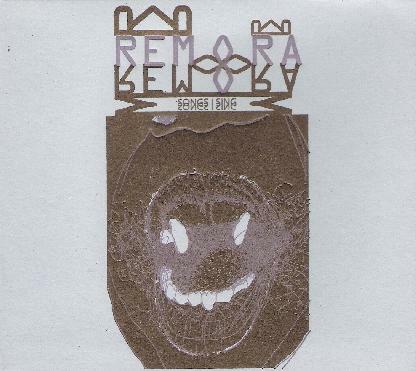 Remora - "Songs I Sing"
Known for his guitar driven explorations into soundscapes and noise, Remora (aka Brian John Mitchell) also adds vocals to many of his songs, making for an interesting combination of music, sound and voice. Songs I Sing is quite different for Brian, being a 13 track, 18 minute, vocal only work. The story is that Brian was touring with Rollerball and because he could only bring one guitar out west with him he would have to restring the instrument on stage whenever he broke strings. So he would keep the audience occupied by improvising songs during the restringing, which Shane of Rollerball liked so much he wanted to release on his North Pole label. Of the 13 songs, three are covers. Coil's "Heartworms" is a standout. I never heard the original but I love the double tracked voice singing "there's too much blood in my alchohol". Brian does a good job with The Stooges' "I Will Fall", which of any Stooges song is probably the most amendable to the kind of vocal treatment Brian is working with. Brian also cover's Rollerball's "Sores", and if you pop the CD in your computer you'll find a video of the song (in AVI, Quicktime and MPEG formats). ALSO…. be sure and read the detailed interview with Brian that appears in his issue. For more information you can visit the North Pole Recordings web site at: http://www.myspace.com/northpolerecordings. For more information on Remora and Brian John Mitchell's Silber Records visit: http://www.silbermedia.com.